New York City’s fighting game community saw one of their own step up to the plate in a big way at this weekend’s Defend the North tournament just north of the city in White Plains. Derek “iDom” Ruffin faced off against Philadelphia’s Victor “Punk” Woodley, arguably the best player in the United States, and effectively tormented the supposedly superior player. It all started when iDom and Punk matched up in winners finals. After defeating another regional favorite in Bryant “Smug” Huggins one round before, Punk was en route to winning Defend the North. But iDom, who is affectionately known as the local scene’s “stoop kid” due to the rarity of his appearances at out-of-state events, acted as the event’s secret boss, defeating Punk in a 3-0 blowout. As their first set came to an end, iDom baited a costly uppercut from Punk and forced him into the corner during the ensuing scramble. 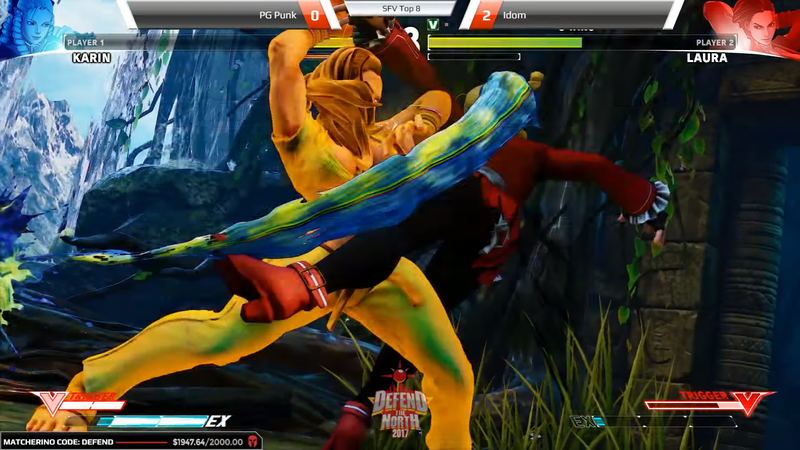 By using a mixture of hit-and-run tactics as well as Laura’s signature fireball pressure, iDom whittled away at Punk’s life advantage. With stun imminent, iDom grabbed Punk one last time, causing Punk to quit the game before taking the inevitable loss. Punk earned his rematch against iDom after advancing through the losers bracket, but the grand finals was more of the same. iDom tore through Punk’s Karin like wet tissue paper, earning another 3-0 victory while the hometown crowd filling the Crowne Plaza Hotel ballroom cheered him on. Upon losing the last round to a perfect, Punk was shocked and stared awestruck at the monitor before shaking hands with his opponent and hopping off the stage. Despite how he felt at the tournament, Punk took to Twitter shortly after to give iDom respect for his performance. It’s fairly easy to make a name for yourself in the fighting game community, now more than ever thanks to the prevalence of live broadcasts for even the smallest local events, but there are still pockets of competition that don’t receive the attention they probably deserve. iDom’s victories over Punk may have come as a surprise to some, but regular viewers of New York City’s Next Level Battle Circuit weeklies knew that it was only a matter of time until he had a breakout performance at a major event. For more Street Fighter V action from Defend the North, check out Team Spooky’s official playlist.